The Undecided Voter: Just Like The Unicorn? 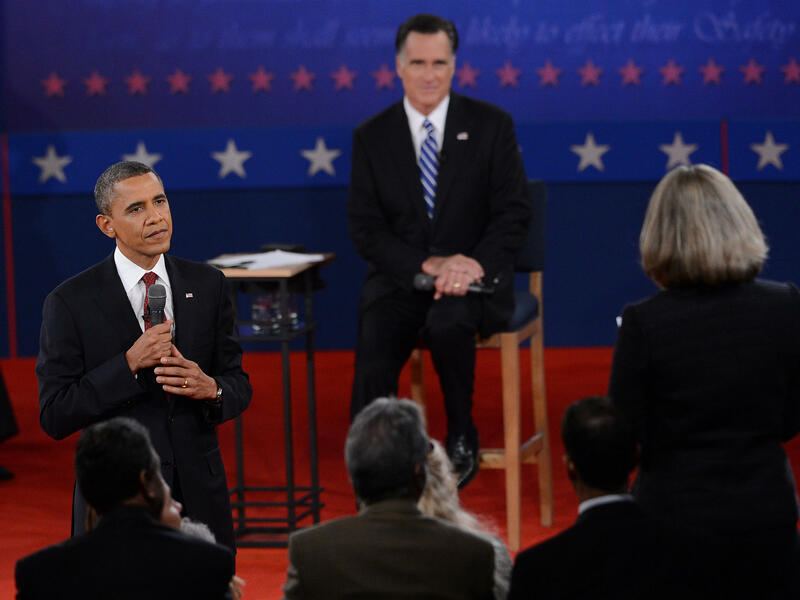 President Obama and Mitt Romney answer questions from undecided voters at the second presidential debate, at Hofstra University on Long Island, N.Y., last Tuesday. Palm Beach Post columnist Frank Cerabino heard something strange on the radio last Tuesday. A local sports show host, Marc Hochman of The Ticket, said that while he might tune in to the Yankees vs. Tigers game that night instead of the presidential debate, he would definitely watch the third and final debate. "That will really decide my vote at this point because I'm one of those undecided voters," Hochman said. Undecided? Really? Cerabino was skeptical. He'd been thinking lately that undecided voters are kind of a myth; that there's no way anyone could still be undecided this close to the election, particularly in Florida, where there has been such relentless campaigning. Lynn Vavreck, a political scientist from UCLA, has tracked a group of 44,000 self-described undecided voters all year, measuring who remains undecided in the presidential election. She says these kinds of voters are just less than 4 percent of the electorate, and that there have been many misconceptions surrounding this group and their power to tip the election. This week, Vavreck received the same email from many friends: a clip from Saturday Night Live poking fun at the idea of undecided voters. "Before you get our vote, you're going to have to answer some questions. Questions like: When is the election? How soon do you have to decide? What are the names of the two people running? And be specific," the "undecided voters" ask. "The premise is wrong," Vavreck tells Guy Raz, host of weekends on All Things Considered. "It isn't that they're looking at Mitt Romney and looking at Barack Obama and weighing them. They're not looking yet." She gives the example of a working single mother, balancing her job and home duties. For her, 20 days until the election is an eternity. "So we rush a little bit to judgment when we say, 'Ugh, these people are idiots.' Well, they're not. They're busy people for whom politics is not the No. 1 concern in their lives," Vavreck says. Meanwhile, politicians and media alike have focused on this group as having the power to swing the election. Vavreck says that's not quite accurate. "First, I think we should stipulate that the reason they get so much attention from the media is because they are the only thing left that's moving," she says. "Nothing is more boring to a reporter than the same thing happening today that happened yesterday. "I think it's a little unfair to say that the election is turning on their decision." Just because they're making up their minds last, doesn't mean their votes are the most important, she says. "They're making their decision late, but if the election were a blowout, their decision wouldn't matter at all," Vavreck says. Vavreck has checked in with this demographic once a week since Jan. 1. She says those who still consider themselves undecided are split evenly among Democrats, Republicans and independents. About 7 percent have changed their minds (from Obama to Romney or from Romney to Obama). Since July, undecided voters have been "as a whole breaking for Obama," Vavreck says. "About 60 percent of undecided voters are women," she says, "and women undecided voters who have made up their minds are breaking heavily for the president — 75 percent for Obama, 25 percent for Romney." In key swing states — Virginia, Florida, Ohio, Iowa, New Mexico and Colorado — the number of undecided voters comes out to about 900,000 people. As former Clinton White House adviser Paul Begala called it, "The American president will be selected by fewer than half the number of people who paid to get into a Houston Astros home game last year." As for Cerabino in Florida, he called up Hochman, the radio host, to confront him about his "undecided" comment. Hochman shared a secret: He's really a Democrat. He just didn't find it worth it to take a side on air, given how divided the country is politically. This admission made Cerabino feel reassured about his belief that undecided voters don't actually exist. He says that deep down those "undecided' voters asking the questions during Tuesday's town hall-style debate actually have a preference. "I think [undecided voters] may be just like the unicorn or something," he says, "this character we like to imagine exists because it makes us feel good." FRANK CERABINO: Right. I'm taking my 13-year-old son to school, and we like listening to this local sports show. Now, we do listen to NPR on occasion, but sometimes we like to listen to sports. RAZ: No, that's OK. No apologies necessary. CERABINO: ...which is one of the reasons we like it too. RAZ: So Frank and son are listening to Marc Hochman's show, and not far into it, the conversation turns away from sports. CERABINO: That night on television, there was the choice between watching the Yankees and the Tigers play a playoff baseball game or watching the second debate. CERABINO: And he was carrying on with his partner there, Jonathan Zaslow. CERABINO: And I heard Hochman say, I'm going to have to tune in at least for that third debate and see, because I'm one of those undecided voters. RAZ: OK. At this point in the story, Frank Cerabino's ears perk up. He's been thinking that undecided voters are kind of a myth, that there's no way anyone could still be undecided this close to the election. CERABINO: ...that he was undecided, I thought, well, this is an intelligent guy. Maybe I have this all wrong. RAZ: So Frank Cerabino called him up. : Yeah, Frank Cerabino called me and he said, you know, I listened to your radio program every morning. CERABINO: I told him, I said, Marc, I listen to your show and I happened to hear you this morning say you're an undecided voter. : He said, it strikes me as odd that you wouldn't have made up your mind already. And I shared a secret with Frank. And I said, I'm a Democrat. : I actually have made up my mind about the election. I was just saying that on the air because it's just not worth it on sports radio to take a side. I mean, this country, we've never been more divided, I don't think. We are 50-50 each way. So I wasn't saying whether I was Democrat or Republican. I was just kind of being aloof on the air and saying, well, I'm still an undecided voter. CERABINO: Once he told me that, it kind of made me feel reassured because, of course, he's made up his mind. He just says that just because he doesn't want to get into a political conversation on the radio. And then I thought, well, see? I think I'm right. RAZ: ...undecided voters? And what did you think? CERABINO: Well, I thought if you waterboarded each of those people, they'd tell you exactly who they were voting for. No, I don't, you know, I don't - I think it may be just like the unicorn or something. This character that we like to imagine exists because it makes us feel good. RAZ: We wanted a more scientific answer to this question, so we called up Lynn Vavreck. She's a political scientist at UCLA. She's been tracking the same group of 44,000 voters all year. She's been measuring which voters remain undecided in the presidential election. And this week, Lynn Vavreck got the same email from many, many friends. LYNN VAVRECK: So many people send me this clip. You would not believe it. RAZ: This is the link that Lynn got with a short skit from last week's "Saturday Night Live" on undecided voters. And, well, it's pretty self-explanatory. RAZ: Now, as we mentioned, Lynn Vavreck says undecided voters are just under 4 percent of the electorate. I asked her who they are and whether there's any truth in that "SNL" skit. VAVRECK: This is the problem. The premise is wrong. It isn't that they're looking at Mitt Romney and looking at Barack Obama and weighing them. They're not looking yet. So if we really wanted to write a skit that would stand next to "Saturday Night Live," it would be, you know, the single mother who has three kids, who has to get up early to make them breakfast, get them to three different schools because they're in different grades, go to her job, worry about what she's making for dinner. She's like, 20 days until the election? That's an eternity for her. So we rush a little bit to judgment when we say, ugh, these people are idiots. Well, they're not. They're busy people for whom politics is not the number one concern in their lives. RAZ: Yeah. I mean, this idea that they're - I think to the contrary, I haven't heard people say that they're idiots. I've just heard people say this is the most desirable, you know, this is the group of voters we are after. VAVRECK: Well, first, I think we should stipulate that the reason they get so much attention from the media is because they are the only thing left that's moving, you know? Nothing is more boring to a reporter than the same thing happening today that happened yesterday. I think it's a little unfair to say that the election is turning on their decision. It reminds me a little bit of the student who comes into my class at UCLA and says to me, oh, Professor Vavreck, your B is going to keep me out of law school. Well, yeah, my B and all the other B's that you got before mine. So just because mine comes last doesn't mean that it's pivotal. But if the election were a blowout, their decision wouldn't matter at all. RAZ: You actually have been researching a group of self-declared undecided voters since the beginning of this year, since January 1st, and going back once a week to find out, you know, where they stand. How many of them have changed their minds? VAVRECK: So among the set of people who claim they are still undecided, many of them actually call themselves Democrats or Republicans. It's about a third Democrat, a third Republican, a third independent. The percentage of people who have changed their mind at least once is roughly 7 percent, moving either from Obama to Romney or Romney to Obama. The undecideds are breaking, and they're breaking in interesting ways. RAZ: How are they breaking? VAVRECK: Well, since July, they are, as a whole, breaking for Obama. About 60 percent of undecided voters are women. And women undecided voters who have made up their minds are breaking heavily for the president - 75 percent for Obama, 25 percent for Romney. So women are more of the undecideds, and they're breaking predominantly for Obama. RAZ: Lynn Vavreck. She's a political scientist at UCLA. Remember, undecided voters are around 4 percent of the population. In key swing states - Virginia, Florida, Ohio, Iowa, New Hampshire, Colorado - that comes out to about 900,000 people. Or, as former Clinton White House adviser Paul Begala said, the American president will be selected by fewer than half the number of people who paid to get into a Houston Astros home game last year. Speaking of baseball, here's Marc Hochman again, that sports talk show host who said he was undecided, but he's actually voting for President Obama. : I don't know. I mean, I guess I have a difficult time believing people are really undecided at this point in the election. You kind of - I think you kind of have to know where you're going at this point. RAZ: Marc, can we talk baseball for a sec? RAZ: Tigers, Cards or undecided? : Wow. Who am I rooting for, or who do I think? : I, yeah, I am undecided on that one. RAZ: Stay with us. Coming up, James Fallows, and later, new music from Ben Gibbard of Death Cab for Cutie. You're listening to ALL THINGS CONSIDERED from NPR News. Transcript provided by NPR, Copyright NPR.